Home / Blog / Aggravate: To Annoy or To Make Worse? The primary definition of aggravate in most dictionaries is “to make worse, more serious, or more severe.” Many experts over the years have objected to the use of aggravate as a synonym for irritate, annoy, or bother. Merriam-Webster’s Dictionary of English Usage notes that the first to object to the “irritate” use of aggravate was Richard Grant White in 1870. Others to condemn this usage include John Stuart Mill and Ambrose Bierce, to name a few. In fact, over the years, people have gotten quite worked up about it. Fowler’s Modern English Usage originally fought the fight as well, but in its 1965 edition, it confesses that “usage has beaten the grammarians” and that aggravate has come to be accepted as interchangeable with annoy and irritate. Writers who have used aggravate to mean irritate (or aggravating to mean irritating) include Washington Irving, Charles Dickens, Herman Melville, Mark Twain, Lewis Carroll, Theodore Dreiser, and John Cheever. 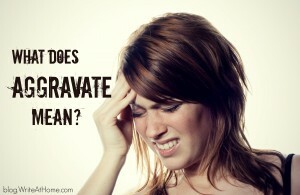 That doesn’t mean aggravate doesn’t still mean “to make worse” or “exacerbate.” That original definition remains and is still primary in most dictionaries. It’s just that the word has clearly added a secondary and related meaning. Make a blogger’s day. Leave a comment below! Wow ~ it only took 14 years to add the “irritate” meaning to the definition! I must confess I’ve always used the word both ways… but I love finding out information like this. I think it’s fascinating! 😉 Thanks!